Correction: The entry at www.historycommons.org says “Saudi Obstructionism,” not John O’Neill. Revelations About Prince Bandar And Osama Bassnan? Hopefully you’ve heard about the partial release of the 28 redacted pages from the Joint Congressional Inquiry Into 9/11. There are still many redactions throughout the pages. The 28 pages Revealed: Who was Code Name: Muppet? Abdussattar Shaikh was the FBI counter-terrorism informant in San Diego housing Hazmi and Mihdhar, the first 9-11 hijackers to come to America and they were being tracked by the CIA and Saudi Intelligence - some would say "assisted by"
Files 17 and 18 tell us Abdussattar Shaikh, the FBI counter-terrorism informant in San Diego housing 9/11 hijackers Hazmi and Mihdhar was code named "Muppet". Thanks to Walter Jones, Stephen Lynch, Thomas Massie, Terry Strada, and Kaitlyn Strada. Perhaps the most remarkable thing about 9/11 is that people often ask us to “Never Forget” while at the same time never learning, let alone remembering, anything about the crimes. This is a beautiful example of Orwell’s concept of Doublethink in which citizens covet their own unconsciousness in order to avoid acknowledging uncomfortable facts. One such fact is that we were given a string of false, contradictory official accounts for the failure of the national air defense systems that day and the last one given is the most unbelievable. The ever-changing accounts for the failure to intercept any of the four hijacked planes began two days after the attacks. That first account was provided in an official hearing to confirm General Richard Myers as Chairman of the Joint Chiefs of Staff (CJCS). Myers testified that no fighter jets were scrambled to intercept any of the hijacked flights until after the Pentagon was hit. Although Myers did not sound terribly confident in his knowledge, people thought he should have been, considering that more than 48 hours had passed and he had been serving as acting CJCS during the attacks. A second, contradictory story was given five days later, when the North American Aerospace Defense Command (NORAD) provided a partial timeline of the notifications it had received from the Federal Aviation Administration and the responses that followed. The timeline showed that NORAD was notified about the hijacking of Flight 175 at 8:43 am, a full 20 minutes before it impacted the south tower of the WTC. Moreover, F-15 interceptor jets from Otis Air Force Base were said to be airborne by 8:52, having been scrambled in response to the first hijacking. 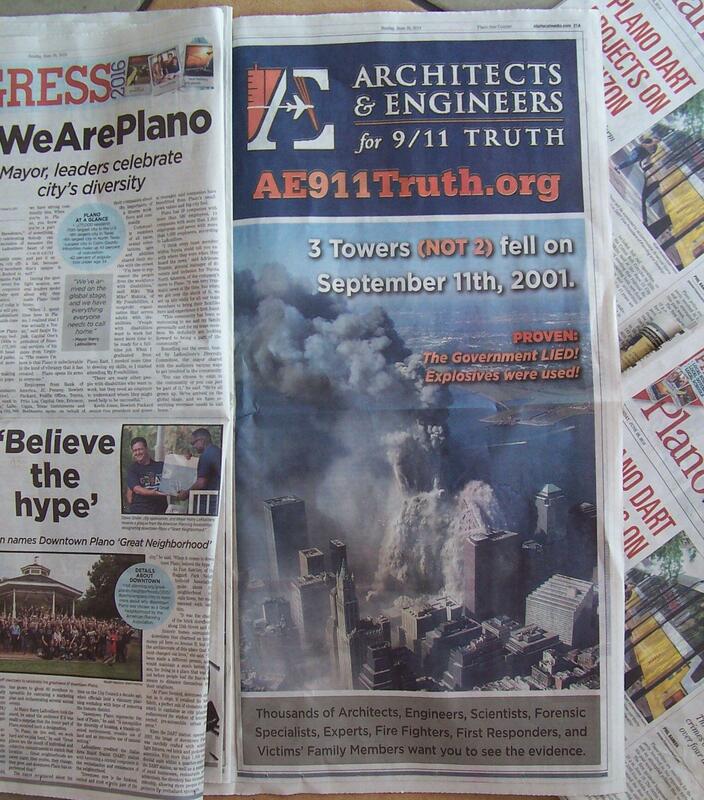 A full page, full color, explosive 9/11 Truth advertisement ran in the Plano Star Courier starting the week of Sunday June 26th, 2016. The dimensions of the full page ad are the typical newspaper size of approximately 10” X 21”. The ad will certainly spark Independence Day fireworks in time for a hot, North Texas 4th of July. How Did Some Experts and Emergency Responders Know the Twin Towers Were Going to Collapse on 9/11? 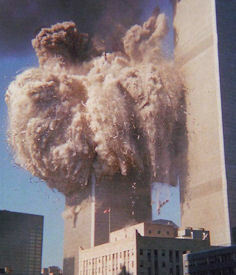 A number of individuals who worked in key positions apparently knew that the Twin Towers of the World Trade Center were going to collapse before the two buildings came down on September 11, 2001. These men talked with colleagues about their concern that the towers might come down, and some of them issued stark warnings about the danger and ordered people to get away from the World Trade Center. Although their warnings have, in some cases, been credited with saving lives, the behavior of these men is, on closer examination, surprising and quite suspicious. This is because the general opinion before September 11 was that the Twin Towers would survive being hit by planes and the outcomes of previous high-rise fires should have led the men to think the towers would easily endure the fires they suffered on September 11 without collapsing. There were so many warnings, and so many indications that this Government knew attacks were coming. We need access to Bush's PDBs among a multitude of other things.